The 16th hole at South Cape Owners Club reflects the natural elements that create a memorable golf experience. 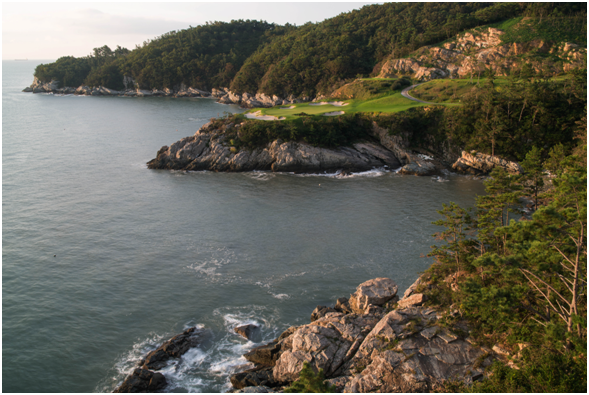 SOUTH GYEONGSANG PROVINCE, South Korea (November 13, 2013) – The spectacular new South Cape Owners Club, nestled along the rugged coastline of Namhae Island in southeast Korea, has made its much-anticipated debut. Designed by internationally acclaimed golf architect Kyle Phillips, South Cape’s dramatic setting and ocean views on all 18 holes have positioned it to become the premier golf course in the country and one of the most significant new golf courses in the world. The golf course is the centerpiece of a luxury golf resort community created by South Korea clothing magnate Jae Bong Chung, the owner and visionary behind the project. South Cape includes a sophisticated boutique hotel (40 suites) and spa, as well as 130 privately owned luxury sea-view villas. In addition to resort play, South Cape will offer club membership privileges to villa owners. The par-72 course stretches to 6685 meters (7,313 yards) from the championship tees. There are also four additional sets of tees, offering fantastic views of the sea and neighboring islands. The dramatic coastline topography at South Cape – “where the mountains meet the sea,” Phillips says – provides a considerably different landscape than more conventional seaside links courses. “We incorporated a links feel into what is not a true links landscape,” said the California-based Phillips, who has designed award-winning golf courses world-wide, including Kingsbarns Golf Links in St. Andrews, Scotland and Yas Links in Abu Dhabi. The bentgrass greens at South Cape offer subtle undulations and contours that create suitable hole locations for everyday play, yet provide ample positions that can easily meet the needs of championship competition. South Cape has a course rating of 75.2 and slope of 138 from the championship tees. The turf for the tees and fairways is bluegrass, while the rough consists of a blend of fine fescues. Dramatic granite outcroppings accent the seaside routing, where inland and coastline holes create a serene rhythm, but can be unforgiving to those who flirt with the edges of the golf course. South Cape offers variation and features memorable holes throughout, particularly on what Phillips calls “the promenade to the sea” that starts with the downhill par-5 11th hole and continues through the par-3 16th. The remarkable collection of par 3s at South Cape is visually inspiring and strategically challenging. Most notable is a breathtaking pair on the back nine – the 136-meter (148 yards) 14th hole, on a spectacular peninsula setting reminiscent of the famed 7th at Pebble Beach Golf Links; and the 204-meter (223 yards) 16th, which plays cliff-to-cliff across a cove, evoking the spirit of the legendary 16th at Cypress Point Club.